GMC Investigations | Doctors Defence Service – UK. The General Medical Council investigates all allegations made against doctors that may indicate that a doctor’s fitness to practise is impaired, by reason of serious professional misconduct, ill-health, or seriously deficient performance. The process and procedure of a GMC investigation is governed by statutory rules and GMC policy. Some GMC investigations are wide-ranging, while other investigations are narrow in scope. The GMC has introduced a new procedure called Provisional Enquiry to close cases early without a full investigation. The GMC will obtain certain information from the doctor referred, and also from their employer and others. If the GMC is satisfied that there are no significant concerns that the doctor’s fitness to practise is impaired, they will close the case. The GMC brought in these changes in July 2016, and has since rolled out out a Provisional Enquiry process, whereby the GMC obtains information at a early stage to determine whether there is evidence that needs a more thorough investigation. The GMC will disclose to the doctor the information obtained, in most instances, and ask the doctor to submit comments. It is envisaged that many cases will be closed at this stage because the evidence discloses that there is no justification for a full investigation. The GMC will use preliminary enquiry procedure where a doctor has raised patient safety concerns (and counter-complaints have been made against the doctor) or where there has been a single incident concerning poor clinical care, either of which (on provisional investigation) do not call into question a doctor’s fitness to practise. The GMC is planning to extend the scope of provisional enquiries over time, to include more complex cases. The GMC’s analysis of the pilot process shows that many cases are closed at this early enquiry stage, saving time, public money, and reducing anxiety for the doctor concerned. We can assist doctors in responding to the GMC at the provisional enquiry stage. See our dedicated page on the GMC’s Provisional Enquiry process. Convictions for serious offences are usually referred by an Assistant Registrar straight to a fitness to practise hearing and so the Rule 4 and Rule 7 stages set out below will not always apply. The GMC case officer sends doctors an initial GMC Rule 4 letter which outlines the complaint or allegations. The doctor has a discretion whether to respond. It is not always necessary to respond but each case very much turns on its own facts. A doctor would be best advised to identify the root cause of the complaint and undergo remedial steps where competence may be lacking. Some doctors lack insight into their own level of competence and should ideally take legal advice as soon as is reasonably practicable, so that objective advice can be given about the steps the doctor might take to improve their prospects of success. An Assistant Registrar will make the decision about whether the case should proceed to further investigation. In some instances, the GMC will invite a doctor to undergo a Performance Assessment or in health cases a medical assessment. If a doctor does not fare well during the performance assessment or they are found to be unwell they may find that restrictions are imposed upon their registration by an Interim Orders Tribunal (IOT). Some allegations involve references to personality issues, that are suggestive that the doctor has a deep-seated attitudinal problem that is compromising their ability to function, both collaboratively with other staff or safely when interacting with patients. In almost all cases the GMC will write to the doctor’s various employers (not only the main employer) requesting information about whether there are any concerns about the doctor’s fitness to practise by way of health, conduct or competence. The replies received will inform the GMC on how wide the investigation should become into the doctor’s current fitness to practise. We cn assist doctors in the compilation of replies at this stage of proceedings. A doctor who is facing allegations of misconduct should look at the allegations in detail and determine the steps of remediation they might undertake to demonstrate insight, learning and ongoing safe practice, especially where the misconduct is admitted. In some instances sub-optimal practice or a poor decision can be quickly remediated. We an advise doctors in relation to the steps they should take to do this. In some cases, it is necessary to instruct a defence expert. to advise the doctor on whether they have fallen into error, and, if so, on the steps of remediation they ought to undertake. This might include undergoing courses and retraining, counselling, and supervised practice. Some allegations may be of such a nature that they include allegations of improper conduct (misconduct or deficient performance), as well as allegations of being impaired by reason of ill-health, whether it be a physical or mental health condition. The GMC Case Examiners have an evidence- and judgment- based discretion to close a case without action; issue a Warning; Impose/Accept Undertakings; or refer the matter to the GMC/MPTS Fitness to Practise (FTP) tribunal for matters to be determined at a hearing. Toward the end of the GMC Investigation, the Case Examiners ( a lay person and a registered medical practitioner) send doctors a GMC Rule 7 letter that sets out the evidence and allegations. The doctor is invited to respond in writing. The doctor will need to evidence what they are claiming in their response. Doctors Defence Service lawyers can advise on Rule 7 responses. However, the Case Examiners give doctors only 28 days to submit their response and that is often too short a period for a doctor to act on legal advice (because of the defence evidence that will need to be acquired and compiled in a suitable form). An extension of time to reply will be granted only in certain circumstances. It is therefore important to undertake as many steps in preparation for the Rule 7 stage as is possble, from the outset of the Rule 4 stage. Doctors should take legal advice as early in the GMC investigative process as possible, so as to ensure that they are undertaking relevant update courses and are taking appropriate steps to arrange supervision, assessment and audits. A doctor who does not wish to accept a warning may make representations to the Investigating Committee. A doctor may also agree to undertakings, by which a doctor agrees to conduct themself in a particular way, perhaps avoiding certain types of work or procedures until they have completed a period of formalised study. 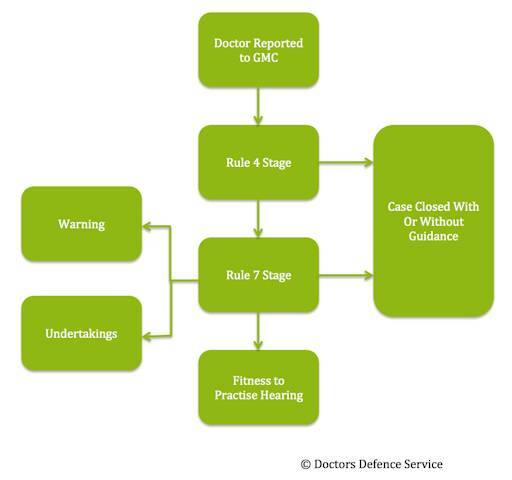 As can be seen in the diagram above, the case examiners can refer a doctors case to a Fitness to Practise Hearing, agree Undertakings, or close the case with or without guidance, or with a Warning. The above diagram is also available for download in PDF format: GMC Investigatory Stages Procedural Flowchart. On another of our DDS web pages you can download our: Flowchart of the GMC Fitness to Practise (FTP) process. Can a doctor limit who can see their reply at the Rule 7 stage?